Have you ever walked through the woods and seen trees that look unhealthy or with strange marks and die off on them? You could have been seeing signs of a pine pitch canker. 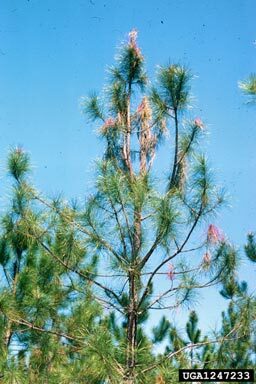 Pine pitch cankers affect many of our pine trees today. This becomes a major problem, especially around Christmas time. Most families spend an enjoyable afternoon picking out their favorite tree to be used as a Christmas tree (check out this web site for more information about different Christmas trees). However, pine trees are being affected more and more by these cankers. The cankers are formed by the fungus Fusarium circinatum. This website is dedicated to explaining how these cankers form and why they are important. The symptoms of the disease are branch die-back, stem cankers, copious pitch formation, and mortality. The usual first signs are the yellowing of the needles and wilting and dieback of the branch tips. The needles eventually turn red and drop from the tree. This organism is rapidly infecting the Monterey pines in California as well as many countries around the world. It is important to recognize the symptoms of the disease in order to figure out how to treat it. As of now, there is no cure for this disease, but knowing more about this fungus will allow more research to be conducted in order to help stop the spreading of this disease.